Should Home Contractors Use Lead Generation services? This was the question I asked after working with a landscaping and lawn care business recently. Talking to the client really opened my eyes as to how lead generation is done within this industry. There are so many home contractors losing money on lead gen solutions that I felt compelled to write my own piece. There is a bigger piece I want to write that shows how any business owner in the home contracting niche can develop a solid lead gen strategy that allows you to own your own leads at a cheaper cost without having to compete with multiple bidders. But that’s for another time. Let’s focus on existing lead generation websites first. Lead generation websites can be a great way to build your client base and online reputation, but they can also seem like a waste of money if you don’t focus on using the ones most suited to your business and use them wisely. HomeAdvisor is a bidding-based site where contractors pay a yearly fee to create a profile. Contractors also pay to bid on any leads sent to them through the site. Leads are not exclusive and come with no guarantee that the client will choose anyone who bids on their project. The site costs about $350 a year to list your business. If you want to get leads from the site, each lead will cost $15 to $40 depending on the price of the project. If a promising lead does not pan out, HomeAdvisor will often reimburse the contractor their bidding fee. According to many site users who specialize in mowing lawns, it’s rare for the leads to turn into regular customers and many of the leads are for small jobs, which may not match your business goals. However, for those who specialize in larger jobs, the leads have been worth their cost. It is one of the oldest and most popular sites for contractors and potential clients. Profiles are easy to set-up and manage and allow you to turn your leads on and off, so you aren’t wasting money when you aren’t in a growth phase. Homeadvisor is notorious for their sales calls. If you sign up on their site for more information or join and later quit the site, then expect sales calls for the next several years. Homeadvisor is one of the most expensive bidding sites to join because you have to pay a yearly fee to set up your profile in addition to paying for individual bids. Most sites allow you to set up your profile for free. I love seeing these posts about HomeAdvisor. I would say 85% if not more of you have never used it in your life. You go based on reviews from people that don’t know how to use the app. Porch is one of the newer contractor sites and has a different model than most. There are two service models: Porch Services where the homeowner enters their project, they get a quote, book, and pay for the service through the site; and Porch Pros where the homeowner posts a project they’d like completed, contractors bid on the project, and all booking and payment is completed offsite. As a contractor, you can choose to pursue both Porch Services and Porch Pros opportunities or simply become a Porch Pro. It’s free to create a profile on Porch, and there are two payment methods. One is the pay-as-you-go method. You get notices about available projects, and you can decide whether or not to pay for the lead. Leads costs are based on the total project price. Small projects cost between $5 to $20, while larger projects run between $35 to $65. The other payment model is a subscription fee where you set your own monthly lead budget. Porch sends you leads until you reach your budget maximum. If you don’t reach your maximum for the month, you are charged less. As a subscriber, you pay less for leads than pay-as-you-go contractors and get the first shot at bidding. This is important if you have a lot of competition in your area as Porch only allows four contractors to bid. If you are unsure if Porch will result in good leads for your service area, you can sign up for pay-as-you-go without upfront costs. If the leads pan out, you can choose to switch to the subscription model to save money. Because Porch is a newer site and not as well known as other contractor sites, fewer contractors are competing for leads on the site. Conversely, because Porch is a newer site and not as well known as other contractor sites, there are often less leads to bid on. Porch prefers companies who can prove that they have experience—meaning they have a robust profile with many pictures of past projects, and a strong online presence. This poses a difficulty for companies who are just starting out. Unlike the other sites, Thumbtack offers services beyond the home improvement industry, so it attracts a wider audience of customers. It’s a bidding-based site that uses a pay-as-you-go business model for contractors. Leads are not exclusive, and there is no guarantee anyone will win the contract. There are two ways to bid. One is to manually make bids on your own time, and the other is to use Thumbtack’s Instant Match service to let the platform bid on your behalf. Thumbtack’s regular bidding system works much like other bidding sites. A customer provides information about a job they want to be fulfilled, then contractors in their area are notified and follow up with a bid. The customer reaches out to you if they like your bid, but they can also reach out to others. With Instant Match, you set your job preferences and detailed pricing for different jobs as well as a weekly budget to limit the number of leads Thumbtack responds to. When a relevant job is posted, Thumbtack sends a bid for you using the information you provided. The customer reaches out to you if they like your bid, but they can also reach out to others. It’s free to create a profile on Thumbtack and to bid using either method. You are only charged when a customer reaches out for a follow-up conversation. However, the cost is significantly more expensive than other sites where you are paying per bid. Thumbtack’s reasoning for the higher price is that you are closer to making the deal if the customer is reaching out to you, so the price is approximately double what you would pay on other bidding sites. A $15 to $20 bid on another site becomes a $30 to $45 gamble on Thumbtack. As with other bidding sites, the price changes to reflect the overall cost of the job. With Thumbtack’s Instant Match feature, contractors no longer have to wait by their emails to constantly respond to job request after job request. It takes some of the stress away from using a bidding model website. If you want to test the waters on Thumbtack, you can still respond to bids manually and avoid the Instant Match program accidentally using your weekly budget on jobs that don’t match your priorities. However, Thumbtack has made it clear that they’d like to switch to Instant Match for all transactions, so don’t wait too long to do so. Thumbtack’s new pricing model is risky. Contractors only pay when a customer responds, but they pay a much higher rate. However, customer behavior hasn’t necessarily changed. Many customers are still just price shopping and don’t realize how much it costs contractors when they respond to their bids. There is no guarantee a customer is only interested in your bid and no guarantee that they will follow through. The price is higher, but the risk of losing money on a bid remains pretty much the same as other sites. Thumbtack’s pricing model is still relatively new, so whether the leads are worth the higher price remains to be seen. Angie’s List is probably the most famous home improvement directory online. Angie’s List is free for contractors to create profiles, and customers to view them, but customers who want access to discounts, and to book contractors through the site have to pay a membership fee. It’s free to create a profile on Angie’s List, but boosting its priority rating to advertise your services costs money. Ads on Angie’s List work a lot like Google Ads. They appear above the organic search results. Even if you have a high ranking, you may want to pay for priority ranking because promoted results display more information to potential customers and look more appealing. Advertising on Angie’s List costs between $4 to $8 per click, so your costs will depend on how large your market is as defined by your preferred zip codes and area of expertise. The cost is negotiable, but it can range from $20 to $3,000 a month. Another potential cost is their members’ love of discounts. Discounts are a great way to get potential customers to use your service instead of a competitor’s, however, using discounts as an advertising method will cut into your profits. Pay attention to what your competition is charging and use discounts wisely. Angie’s List is a the most popular and well-trusted site for potential customers. It’s free to create a profile on Angie’s List, and if you ask current and past customers to leave reviews for you on the site, you can build a solid profile that can result in leads without spending any money. Because potential customers often view Angie’s list as the gold standard of contractor directories, the best way to get business through Angie’s List is to have a great reputation on Angie’s List. 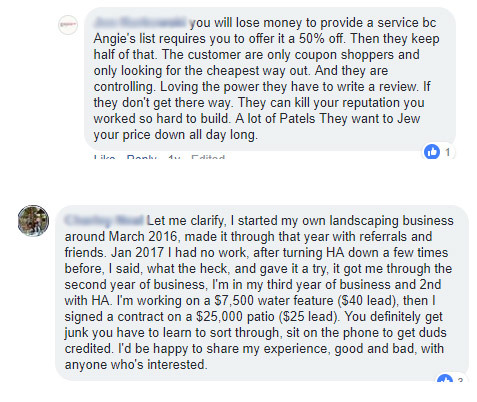 But to do that you have to get Angie’s List customers to hire you, which can be hard if you don’t already have a bunch of good reviews on the site. It’s a chicken and egg situation. Everyone can leave reviews for your company, but only Angie’s List members reviews can change your grade and therefore your ranking. If you don’t have an “A” ranking and you live in an area with a lot of competition, it can be difficult to get visibility in the search results. However, the more popular your area, the more expensive advertising is… But if you don’t have that “A” ranking or a lot of good reviews, then the less likely someone will pick your company even if you do appear at the top of the list, so is advertising really worth the cost? There’s a lot of philosophizing in the Angie’s List “Cons” section with no real answers. It really depends on your budget and business plan. Are Lead Generation Sites Worth It? If your business focuses solely on lower-priced jobs like lawn-mowing, then the cost of bidding sites can be prohibitive for a new business with low-profit margins. The bid itself is already costing a large percentage of your profit (especially if it ends up being a one-time job) and you only make money if your bid wins. Bidding sites are a better model for businesses that offer higher-priced services, but the effect of a stellar online reputation for lawn mowing services can be exponential. It can mean the difference between you always needing to reach out for new leads and leads proactively reaching out to you. That’s why working a lead-generating site into your budget may be worth the cost as long as it results in good reviews for your profile. All bidding sites come with the caveat that customers are not always serious—sometimes, they are simply price shopping. Expect to use a percentage of your marketing budget on lost causes. It’s a numbers game, and your chances largely depend on how many competitors you have and how your profile stacks up to theirs. I also visited the Better Business Bureau and compiled data about the 4 lead generation services that’s in this article. I’m published 2 major data points regarding satisfaction level of users, which includes the avg customer review along with the number of complaints filed in the last 3 years. As you can see, both charts do not paint a flattering picture of the major players in this market. Regardless of whether you spend any money on these sites, you should be creating robust business profiles on every popular, free site for contractors. If it’s free to create a profile, do so. First, it’s good for business to have your profile on any site someone might check. And second, someone else might do it for you with fake information that can end up hurting your business. Other than that, which site(s) you choose to focus on depends entirely on your business goals, budget, and the time you have to devote to it. When deciding where to spend money, you should understand which sites will have the most viable leads. Angie’s List often has the most qualified prospects because it has the most recognizable brand and people trust their reviews. However, you don’t necessarily have to spend any money on Angie’s List. Instead, ask satisfied customers to leave reviews on Angie’s List to build your reputation—even if they didn’t hire you through the site. The bidding-based sites are a mix of serious customers and customers who are only price shopping. When choosing which site to focus on, search for local competition. A good strategy may be to start with the site with the least local competition, so you have a better chance to win the bids. However, because of the lack of local competition, you may have fewer bids to work with. There’s always a give and take. Research your competition’s profiles and make sure yours stands out. Create a professional description with all of your specialties listed as well as any certifications. Then add images of the best lawns and yards you’ve worked on. Call your leads within 5-10 minutes of hearing from them. You are competing with other companies, so if you aren’t immediately available to your potential client, then you’re wasting your money on bidding. Expect to pay hundreds of dollars (or more) in leads for the first few months. It will take a while to build your reviews and client-base so you will need it to play the numbers game and increase your conversion rate. Once you have 30+ great reviews on a site, then you can cut down on your spend as people will begin calling you directly. One of the hardest parts of building your business is getting new customers. Any of these sites can help you find landscaping leads, as long as you use them wisely. If you have any questions about the best ways to get landscaping or lawncare customers, contact us to find out how we can help.